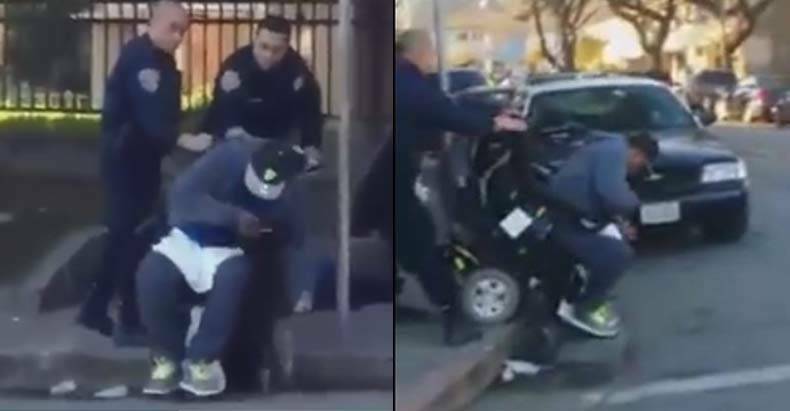 San Francisco, CA– A video clip uploaded to Facebook on Sunday shows an officer attempting to throw a man from his wheelchair and into the street until someone rushes over to intervene. The man who uploaded the clip, Edwardo Delacruz, is the cousin of two of the men seen in the video, and he alleges that the officer attempting to toss his paralyzed relative off of the curb is Officer Carrasco, badge number 1341, of the San Francisco Police Department. Several other officers are also visible in the video and do nothing to stop the assault. Thankfully the man was strapped into the chair and the officer did not complete his goal of smashing his face into the pavement. Another video of the incident shows just how disgusting this officer’s actions were. The Free Thought Project spoke to Delacruz who explained to us that one of the men sitting on the ground and the man in the wheelchair, Devaughn Frierson, are his cousins. Frierson is a quadriplegic, paralyzed from the neck down after an accident 2 years ago. He has enough limited movement in one arm to control the wheelchair only. According to Delacruz, the police officers in the video knew this. The men were joking around as Frierson did wheelies and tricks in his chair and the man on the ground playfully called the police over to come arrest the man for messing around. Delacruz tells the Free Thought Project, that before they began filming, the officer had assaulted the man who was sitting down. “The guy in the wheelchair and the guy sitting on the ground are my cousins. The police are community police, they know everyone in the neighborhood.” Delacruz said. No crimes had been committed, no arrests were made, yet this officer still tried to throw a wheelchair bound man into the street face first according to Delacruz. “No one was arrested because no one committed a crime, they just didn’t like seeing the fellas joking and playing so they came and bullied everyone and didn’t know they were being filmed.” Delacruz told us. About a minute and a half into the video the officer exclaims, “he f*ckin ran my foot over!” in a bizarre attempt to justify bullying a disabled man. Delacruz maintains that this is a lie, and that the officer made that claim after noticing he was being filmed. He also pointed out that the officer does not react the way a person who had their foot run over would have reacted. “If you look at the video, he doesn’t jump or react in a way that a person (would) who just had their foot ran over. He said that when he realized he was being filmed. He tried to flip him because he didn’t like my cousin confronting him about slamming my other cousin on his head. He didn’t like the truth being told to him, so he tried to flip him out of the chair. That’s what the conversation he and the cop were having prior to the cop grabbing his chair.” Delacruz explained. Police and their supporters love to talk about how there are “mostly” good cops, but where are they? In almost every video or story of officers committing outrageously offensive and despicable acts, there are other officers standing nearby and not stopping them. Protect and serve who, exactly? Each officer in this video is complicit in this assault on a man unable to defend himself. Sadly, if similar cases we have seen prior to this are any indication, this officer will not even receive a slap on the wrist, let alone his peers who stood by and allowed it. In July, a police department in Lafayette, Indiana, released dash cam footage which showed lieutenant Tom Davidson pushing over Nicholas Kincade, a 25-year-old paraplegic who uses a motorized wheelchair to get around. Despite the horrific incident being caught on video, the officer only received a 30 day suspension and a year of probation for the attack. In February, 50-year old, wheelchair bound, Anthony Jon Jackson was pummeled and thrown from his chair by Duluth, Minnesota Police Officer Richard Jouppi. The officer was actually charged with fifth degree assault and disorderly conduct, but all charges were dropped despite this incident also being caught on camera.